Wow, what an incredible weekend this past weekend was! If you follow me on Social Media then you already know why it was such an incredible weekend: I PRed at both Saturday and Sunday’s races! Never in my wildest dreams did I think that I would have a double PR weekend! I can’t wait to recap both races this week! And I hope that my high from my double PR weekend continues well into the coming week! My two races this past weekend capped off a great week of training. With only one more week until I restart half marathon training again, I know that its important that I continue to focus on strength training and running maintenance this coming week. The stronger that I am before I start training for Rock ‘n’ Roll Virginia Beach, the stronger I will be throughout my training and on race day. QOTD: What was the highlight of your weekend? This entry was posted in Training and tagged Jaguar 5K, Manassas Runway 10k, running, training, treadmill, walking, weekly recap, weight training. Bookmark the permalink. Nice job on the double PR weekend Kathryn. My weekend consisted of volunteering at a local race and alot of couch time. I have been exhausted the last few days. I think the food poisoning/hospital visit and running a marathon so soon after has finally caught up to me. Thanks Pam! I think you earned your couch time. Great job on the PRs! That will carry you into your RnR! Yes, I’m hoping so Wendy. Congrats on 2 PRs!! That’s awesome! So proud of you Kathryn! I KNEW you were going to PR at least one of them! But BOTH? WOW!!!! I was surprised too, Mindy. Great job on the PRs! 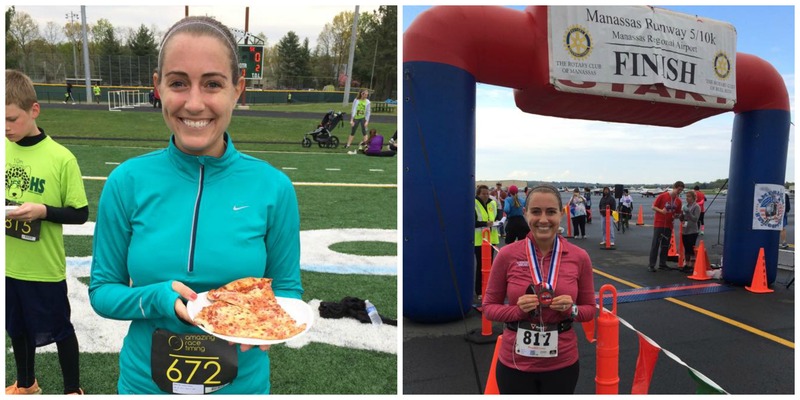 Double PR weekend – girl that is the way to do it!! Congrats!! Thanks Mar! And yes, the pizza was delicious. Great work on he PRs!!! I am happy for you! Great Week! I only ran about 5 miles last week but working for more this week. Go get ’em this week! Amazing! Congrats on that smashing PR success 🙂 I very nearly PR’ed at a 4-miler this weekend, but missed the mark… Next time! You’ll get it next race! way to go, lady! what a weekend! So happy for you! You have worked hard for those! Congrats! I’ve never even heard of the Manassas Runway 10k. I love running the Manassas battlefields but that’s the only running I’ve done out that way. Congrats on your PRs! This was my first year running the Manassas Runway race. I highly recommend it! Way to go with that tri! I love doing yoga with my husband. Its often difficult to get him to agree to do it, so when he does its definitely special. you rocked it this weekend-congrats again! Woohoo! Double PR’ing is awesome, way to go!! Yay, congrats on the PR’s. Can’t wait to hear about them! That pizza post race looks yummy! I think they should have pizza after every race! Yes!! I knew you could do it. Can’t wait to read about both races, especially the Jaguar 5K. Did I read that right? A double PR? Woohoo! I can’t wait to hear all about it. Two PRs!!! That is awesome, congrats! The highlight of my weekend was just relaxing. Great job on both races. Best of luck for the races you have coming up! Two PR’s in one weekend? How amazing! I can’t wait to read your recaps!! Huge Congrats! Congrats! It is always so exciting to PR. Look forward to your recaps!